We were just told that this concert will be the last Stoop Concert EVER!!! 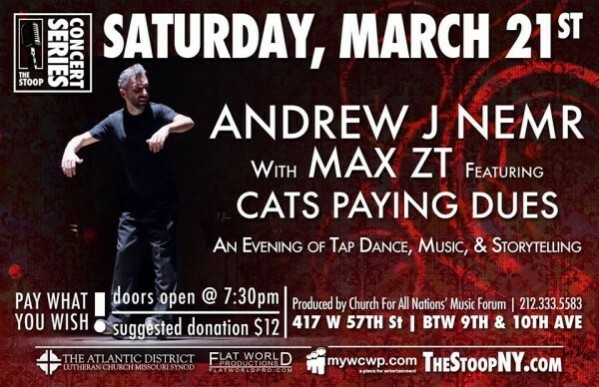 The Stoop has been a venue for independent artists and the Hell’s Kitchen community for years, and we are honored to be the last artists to be playing their stage. Church for All Nations is a beautiful space and we will be filling it some of this, and some of this. Tap Dance, Live Music, and Storytelling – two sets, and an artist talk back during the break. Tickets are pay-what-you-will (suggested donation of $12 gets you a tote bag), and available at the door.